do Stobart Air actually operate under their own brand, or just wet leases for other (competing?) airlines? What about Stobart flights operated under the Flybe brand, I guess they will be rebranded? It says not but that makes little sense. It does make sense depending on the length of the deal to fly that route. If the plane isn’t utilised 100% by Flybe, then why would it be rebranded? It wouldn’t surprise me if Stobart arrive in one airport as one airline and leave as another. Also rebranding would make it difficult if Stobart want to sub in other planes on different routes for maintenance or other reasons. Sounds pretty reasonable actually. I’d be happy to see Little Red return, esp for domestic connections onto VS long haul at LHR! 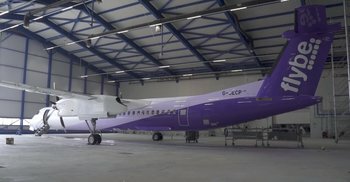 Is there any info about the existing franchise deal that Blue Islands has with flybe? Will this change to a Virgin brand too? +1 Would be great if this results in jets flying from LCY – JER. I have a reward flight with stobart air in July… What does the takeover mean for this flight? Will it be cancelled?? Not sure where that Little Red image came from but the Little Red (wet leased Aer Lingus) aircraft had Virgin Atlantic as their branding on the aircraft. Yes I know. This is some concept artwork which was never used. Rebrand their small Embraer fleet to Virgin and have them fly into LHR rather than their Dash-8’s and create a more streamlined ‘jet to jet’ connecting option? It’s quite fun having the Dash’s at Heathrow. But yes, it would be a better experience connecting to/from EDI with one of the Embraer fleet. It does feel like BA have started to up their game again on the domestics in anticipation of the competition with the Virgin brand. Boarding/Disembarking from front and rear at Edinburgh is happening on almost every flight speeding up turnaround considerably. On the last 3 flights it’s been fully boarded and the doors have been shut 10-15 minutes ahead and we’ve been on the runway or airborne at the timetabled departure time. Just need to find a way how to speed things up at Heathrow. And what appears to be a dead link. Most likely linked to the “Bonvoy” launch on 13/02. Yep – 12/02 is the last chance to get SPG Amex (USA). UK to follow shortly, no date announced. Might happen, but nothing firm AFAIK. Anyone invited to the Bonvoy party at Sotheby’s by the way? Looked like a general invite, not a press event. No-one has a press event at 11am on a Sunday ….. I would be very surprised if the document were to conclude that Flybe was operational, had a potential future, and could have possibly achieved a better exit for shareholders through Administration. Virgin from Man only fly direct to MCO, JFK, LAX, LAS, BOS, BGI, ATL. and a code share on Jetairways to BOM. No Delta flights. In fairness, they are Virgin ATLANTIC but hopefully this might lead to an increased MAN presence. No mention of a Loyalty scheme? I only use Flybe as my company sanction it. We loathe Virgin but I guess we’ll see what happens. Trains are usually more reliable on Flybe domestic network anyway. Hope the Flybe staff jobs are safe. ‘Flybe can confirm that, with effect from 30 April 2019, we will no longer be an Avios partner and that after this date customers will no longer be able to collect or spend Avios with us. As somebody based in the South West, I feel that the air routes from NQY will prosper due to how bad the new Hitachi trains are from Paddington to Penzance. So uncomfortable! Thids would encourage me to fly the route rather than get trains, even if they are often more reliable. Maybe such a route will prosper for Virgin consortiums new takeover. I will watch with interest. Try taking a train from Inverness to Belfast ! Ryanair has recently acquired an UK AOC, so domestic flights should be ok. Seems like quite a broad update. ‘Enhanced’ could mean literally anything, but reckon it could become more MAN focused. The rest of it, I’d expect loss-making routes to be culled aggressively. Don’t think there will be ever huge profits in it for the medium term, but as one big flying advertisement for Virgin it could make sense. Little red didn’t work so not sure why this will. And it is Gatwick that needs linking to Manchester for long haul. LHR already is. Because Little Red was a brand new airline? This is an existing airline that already has a customer base. What is true, though, is that Little Red was a) very pleasant to fly, b) went into Heathrow, c) sold tickets very cheaply and d) was throwing massive bribes at people, eg a BA Gold card holder was given a Virgin Gold card for taking one Little Red flight. (e) Forgot that the “Bread & Butter” of the EDI-London route was the Domestic passenger, not the Heathrow connections. The 16:25 was too early for a day’s business in London. The 19:50 was too late back. Andrew, I’d agree with that, but FlyBe then throw away their opportunity to capitalise on this by using small noisy propeller planes on these routes rather than their Embraers. That, to me, wasn’t a failure. The Dash 8s aren’t that bad on a short flight. The small size means 2×2 seating and you get on and off quickly. Yes, the Embraers are more pleasant but most business travellers on short haul want their flight at the right time and don’t care about the aircraft type. Most other considerations are secondary. Little Red failed partly because they were wet leasing from Aer Lingus at high cost. This won’t be the case with Flybe. Will be interesting to see what they do with the substantial route network Flybe babe from Birmingham. I wasn’t flying much at that time but did maybe half a dozen Little Red flights while they operated. They had better bacon rolls than BA in the morning and Bombay Sapphire instead of Gordon’s Gin for the return and were in no way shy about handing them out. Plus, they were v cheap and the loads on EDI-LHR were so poor you often got a row to yourself. Commercial suicide, but for a passenger it was great while it lasted (much like BMI, really). The back end operations and philosophies will need to be burnt to the ground and built back up with Virgin style customer satisfaction focus, rather than short sighted flight cancellations due to loads. Continuing the Flymaybe logic would destroy Virgin’s image. Flybe dont seem to be doing themselves any favours at the moment , hitting everyone for charges to check-in their slightly over sized carry on bags , bags that used to be fine to bring on. Is this just one last ditch attempt at getting some money into the bank to keep the lights on ? Hard to see it as anything else.